Happy Holidays everyone! For this special time of year, I thought I'd try something new for my site. Last year, and again this year, my friend from Japan Kenji Fukui (@madoqa on twitter and his blog http://shortash.blogspot.com/) sent me a nice little Christmas present consisting of some Cuban cigars. The difference between last year and this year is, after I sent him a thank you note, he responded with a "review them" request. SO Kenji, here is your review, and consequently my first Cuban cigar review posted on this site. I hope you enjoy it. According to Adriano Martínez, a former executive of Habanos SA, in Min Ron Nee's Illustrated Encyclopedia of Post-Revolution Havana Cigars, the Trinidad brand was first produced in 1969 at the El Laguito factory in Havana. In the early 90's, the cigar received much attention in Cigar Aficionado after an interview with Avelino Lara (formerly the manager of El Laguito, and a producer of cigars for the Graycliff Hotel in Nassau, Bahamas until his death on October 27, 2009). In the 1992 interview, Lara claimed that Trinidad was an ultra-exclusive brand that only Fidel Castro was authorized to hand out as diplomatic gifts. Lara also claimed Trinidads were of a higher quality than the much-lauded Cohibas that had formerly been diplomatic exclusives before their mass-market release in 1982. 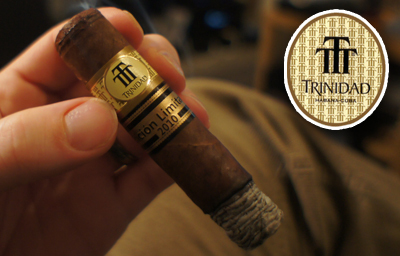 The short robusto format is one of my favorite sizes in cigars and the Trinidad LE 2010 is a perfect example of the size. The one aspect of the cigar that stuck out the most visually was the tiny pigtail added to the head of the cigar to finish the cap. The wrapper of my Trinidad Short Robusto was a nice chocolate brown color with a few small veins. The prelit aroma was very faint with just a slight odor of mild tobacco. The cap clipped easily and the draw was nice with a flavor that tasted berry-like...a bit like a mixed berry compote. 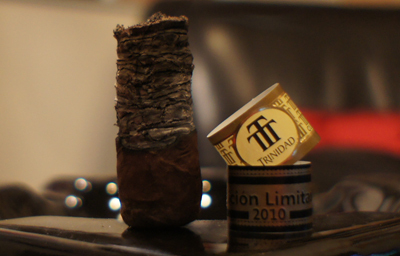 The first half of my Trinidad Short Robusto had a two distinctly different flavors. It began with a very light/mild wood tone...not quite cedar, but something in that area. The smoke left a very cobwebby texture on my palate, which I tend to get almost every time I smoke a Cuban cigar. As I burned further into the first half, I started to pick up some coffee notes on the finish. It was mild, but very much there for the tasting. The construction was excellent and as you can see in the photos, the ash was solid as a rock. The strength was in the medium range. 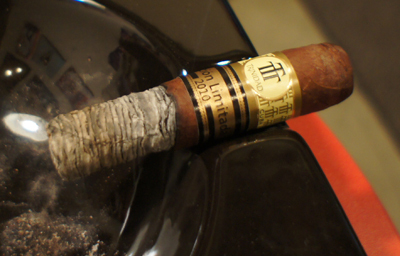 The second half of my Trinidad Short Robusto was very entertaining and enjoyable because it was quite a bit different than the first half. The flavors took a turn for the more spicy side and I picked up a powerful, yet refined white pepper. I hadn't expected this flavor at all because the first half was very mellow. The finish of the cigar still had just a hint of coffee, which made an interesting mix with the spicy front end. Again, the construction did not fail me and I was able to burn this cigar well into the hot-finger-tips zone. 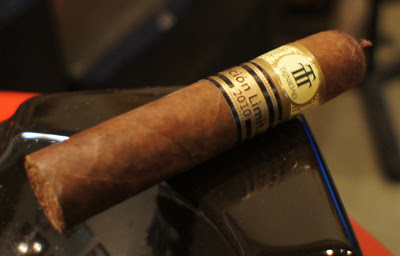 Final thoughts on the Trinidad Short Robusto T LE 2010? This stick started out a little boring for me, but then turned it up a notch about half way through. The stick doesn't have a very strong "Cuban twang" that so many reviewers talk about when it comes to Cubans. Was it the best Cuban cigar I have ever smoked? No. Was it the worst? Not even close. Overall, I enjoyed the experience and want to say thank you again to Kenji for the wonderful present. Would I buy it again? If I had to choose between this cigar and the regular Trinidad Robusto T, I think I'd go for the non LE edition. It's a similar smoking experience, but with even more flavor. Would I buy a box? For the same reasons above I would not buy a box of these.